Born of unbridled enthusiasm for historic preservation and determined confidence in the merits of adaptive reuse, the Raoul Wallenburg Conference Center at the Inn at Millrace Pond opened its doors in 1999. The rescue and renascence of a dilapidated 170 year old home has resulted in singular opportunities for productive meetings in a state of the art facility on the grounds of the renown 17 room inn and restaurant in Hope. Mid 1996 found the Bottomley House, a structure familiar to residents of the Village of Hope since 1830, destined for demolition. Boarded up and uninhabited since the 1970s, the house occupied a weedy, unimproveable lot in the village's Historic District, an area also included in both the State of New Jersey's and the National Register of Historic Places. Hope was created as a planned community in 1769 by the Moravian Church. Contrary to its disheveled exterior however, the Bottomley House's interior remained in remarkable condition, retaining much of its 19th century character. Having never been improved with modern plumbing nor refitted with contemporary decor, the home qualified for review by Hope's Historic Commission prior to its demise. At their June, 1996 meeting, the Commission decided to recommend alternatives that would include moving the house, preferably within the Historic District. After months of debate, Charles and Cordie Puttkammer, with a desire to help and an eye for the unique, won the right to move the building 3/10 of a mile to their property at the Inn at Millrace Pond. Dec., 1996- The Bottemly House arrives on the Inn at Millrace Pond property. To construct a building twice the size from scratch would have been cheaper and immensely simpler. But the Puttkammers, interested in character -- and a challenge -- hired Mennonites from Pennsylvania, familiar with structures of that period , to take the house to its new home. The December, 1996 move entailed removal of the house's roof, gables and chimneys; raising power and phone lines enroute; taking down the blinker in the middle of town; and a round about, alternate route to avoid disrupting fiber-optic cable. Before the house could arrive at its final destination, its original stone foundation was transported and reconstructed at the inn property, the earth basement replaced with a concrete foundation. Finally in place and recapped with a slate roof, unshuttered windows once again allowed sunlight inside the Bottomley House, and restoration began. 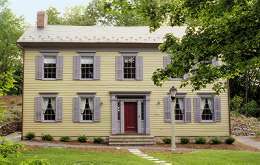 More than two years later, having prevailed over the rigors of historic restoration, endless permits, inspections and superfluous expense, the house now appears, in large part, as it did in 1830. The sturdy pegged beams and most of the interior woodwork, including handcarved paneled doors, stair banisters, and window casings, remained relatively pristine, requiring only surface refinishing. Wide plank pine floors gleam once again with a rich luster, enveloped by walls of lime plaster, repaired or reapplied on white oak lathe in the traditional manner. Even the exterior paint matches chips from the original coating. A small portion the original building proved unsalvagable, but the timbers were saved and stones from a kitchen fireplace reassembled in the main conference room. An entirely new, but completely compatible, section joins the rear of the house, containing a modern pantry and bathrooms, keeping the original structure free of plumbing modifications. On the second floor, the main meeting room expands from the old into the new, affording generous 20' x 40' space, equipped with all the contemporary devices required for modern communication. A rear entrance and second interior staircase provides alternate access to the main conference area, utility rooms, and to a large patio at the back of the house. Raoul Wallenburg, for whom the conference center has been named, was a hero of the Second World War, saving thousands of Hungarian Jews from Nazi extermination. "What he did in World War II is probably the greatest single achievement in resistance to Nazi horrors that anyone can be credited with" says Charlie Puttkammer. "He was taken prisoner by the Russians at the end of the War and disappeared into the Gulag." Puttkammer's affinity with Wallenburg stems from his father, of German descent, whose loathing for the Nazis was early and strong. Charlie and his wife Cordie bought the Inn at Millrace Pond in 1994, fulfilling a long time ambition to become innkeepers after public administrative and academic careers that took them around the world. Charlie explains, "We have a feeling about innkeepers, which isn't unique by any means. Our principal task is to avoid large hotel formality or excessive suburban restaurant fanfare. Rather a true warm welcome for people who are staying or dining at the inn, excellent food, but not necessarily served with the elegance you would find at a very expensive New York City restaurant. To some people we appear a bit rustic in the rooms and somewhat informal in the restaurant. But for the most part we're comfortable with this and feel that most people feel very welcome here." The Puttkammer approach to innkeeping will hold over to Conference Center. "The house has all the modern electronics that a facility should have; communications and all that. But, if people are going to come out here for a conference, our hope is that they would feel when they left that it was a more enjoyable and profitable experience than it would have been in another faceless hotel room. They will be less interrupted in their minds and in fact by the trappings of being near their office." The grounds at the Inn are charming, and a walk to the millrace pond should clear any busy mind of encroaching clutter. And from the famous grist mill, where so many have already enjoyed elegant hospitality, it will be hard to look across the lawn at the old, proud house and imagine that it belonged anyplace else. 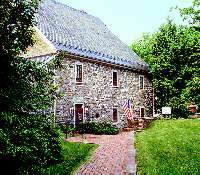 The inn and conference center are located one mile off Route 80 Exit 12 in Hope. The facility will comfortably accommodate meetings of up to 25 participants. For more information please call 908/459-4884.